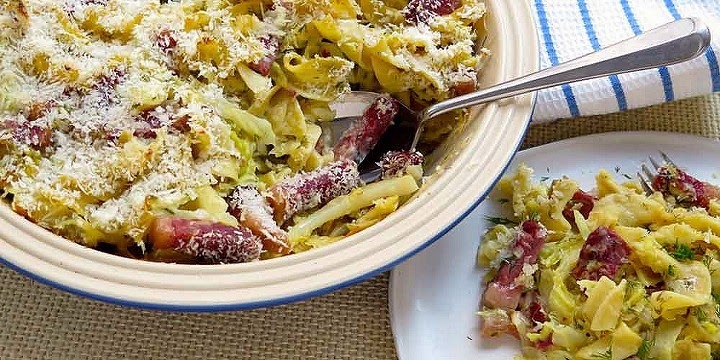 Cabbage and noodles are a winning combination. Add corned beef in a creamy dill sauce and you have a very special dish perfect for weeknight or entertaining meals. Preheat oven to 350 degrees F. Butter a 2-quart casserole. Melt 4 tablespoons butter over medium heat in large saucepan. Add onion; cook, stirring, 3 minutes. Add cabbage and salt and pepper to taste; cook, covered, 5 minutes, or until cabbage is just tender. Sprinkle with flour; cook, stirring, 1 minute. Add broth; bring to a boil. Simmer, stirring, until lightly thickened. Add sour cream, dill and mustard. Fold in corned beef and noodles. Transfer to casserole, sprinkle with panko or breadcrumbs and dot with remaining butter; bake 25 to 30 minutes, or until heated through and lightly golden. Thank you so much for sharing with Roses of Inspiration - I hope you join us again next week. Hugs!